Serena Williams really mean it this time. After blasted the WTA Tour over its policy for dealing with players who pull out of tournaments through injury, Serena Williams 'had no choice' but to play at the Madrid Open Tennis only to retire after the first set citing a right leg injury. Francesca Schiavone was leading 6-4. 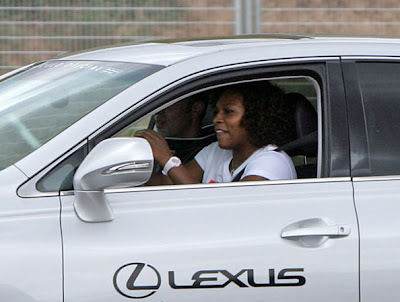 Although her participation was cut short, at least Serena had fun yesterday hanging out with Juan Martin del Potro test-driving a new Toyota Lexus. Serena likes blogging, twittering and now fangirling. Serena is no.1. Del Potro gives a cynical smile. Would anyone take Roger Federer seriously? 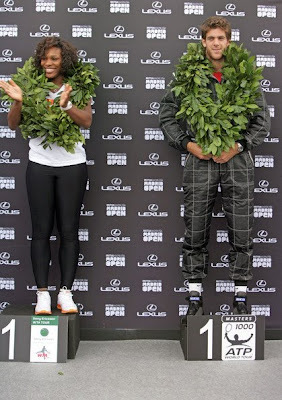 Would WTA take Serena Williams seriously?